Magento 2 Google Shopping Feed: Connect and submit your Magento store product data to Google shopping feeds. You can map product attributes for the shopping feeds data. Automatic feed update on product save. Map Magento store categories to Google shopping feed categories. Magento 2 Google Shopping Feed: Google Shopping is a Google Service for product listing ads. This Google service is one of the best way to display your products in the SERP whenever the customer searches for a product using the Google search. For Google Shopping ads, Google Merchant account is a prerequisite. In Google Merchant account, you need to keep product attributes as “Product Feeds”. The Magento 2 Google Shopping Feed module integrate your Magento store to the Google Merchant Account. Using this module, the admin can submit Magento store product data to Google Merchant Account. The admin can create Google Product feeds for their store’s products, export the products to their Google Merchant account, and map the Magento attributes and categories with the Google Merchant account. Also, Google Feed gets auto updated once the product gets saved on the store end. Easy Authentication process for Google Merchant Account. Flexible settings for attribute and category mapping. Export the products in just a single click. Enter the OAuth Consumer key and the OAuth Consumer Secret. Indicate the category of your item. Enter the weight unit that you are using for your store. Select the target age group of the item on Google feeds. Select the target gender of the item on Google feeds. Set the product condition as New, refurbished, or used. Enter the tax rate in percentage of the item on Google Shopping Feed. Select Global or As Product for the Tax applying on Shipping. Select Yes or No to apply the tax on shipping. Under the map attribute section, the admin will be able to map the Google Merchant Account attributes with his Magento store attributes. The module has an easy configuration to map the attributes as per the requirement. The admin can even reset the saved attribute mapping. The admin can map the attributes like Product ID, Title, Description, GTIN, Brand, Color, MPN, Shipping weight, Image. It also supports many to one type of attribute mapping. Can't export the product until and unless all the Google Merchant Account attributes are not mapped with Magento store attributes. To map the categories the admin will map the Magento store categories with the Google Merchant Account as per the Google Product Taxonomy. Category mapping enables the exported products automatically get assigned to the mapped category only. Select the Magento category and then accordingly select the Google Merchant Account categories and subcategories to which you want to map the Magento category with. You need to select the leaf category for mapping. The admin can even delete the existing mapped categories. The module has flexible settings to export products to Google Merchant Account in just a single click. 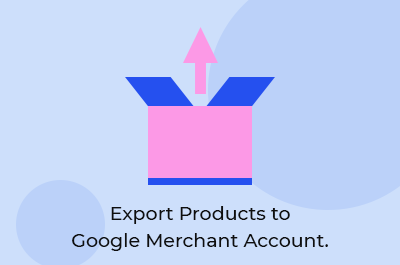 To export the products successfully, the Google Merchant Account should be authorized. The admin can export the products by clicking the “Export to Google Shop” button available in the admin backend configuration. A pop-up window will display to check the product sync process. Check the exported product by navigating to the Google Merchant Account. Can edit the exported product details in Magento store and respective product details get auto update in Google Merchant Account. The product gets deleted from the Google Merchant Account also if the exported product gets deleted from the Magento store. Check the all the exported products by navigating to the Google Merchant Account. Separate list to view all of the products that have been synced. Also, view the synced attributes of the exported products. It might take up to 2 hours for all the products to get visible at the merchant account. Manage product data before sending to Google Shopping. The admin can edit the exported products. And can even delete the exported products whenever required. Use the imported products for an ad campaign. Google Feed Auto update on product save on store. Many to Many Category mapping available. Supports Simple, Virtual, Downloadable, and Configurable product types. Product if deleted at Magento is auto-deleted from the Google Feeds. Did you buy Google Shopping Feed For Magento 2? Really an awesome module works great in my store. Thank you so much for your dedicated support. I really appreciate your team support Keep going. Does the admin define the default category for product export? Yes, the admin can configure the default category of Google for product export if the categories are not mapped. Does the module support real-time sync? Yes, the Google Feed gets auto updated once the product gets synced successfully. Can the admin sync the product image? Yes, the admin can sync the product image but only one image. Will the product gets removed from the Google Merchant Account if the exported product gets deleted from the Magento store or the vice versa? Yes, the product gets removed or deleted from the Google Merchant Account if the exported product gets deleted from the Magento store or the vice versa. The module supports simple, configurable, virtual and downloadable product types for export. + Individual products can export to google shopping feed. + Store Product and Google Product Feed Map record grid. + Store products add to Google Feed using content API. + Google Feed Auto update on product save on store. + Map store category with Google shopping feed categories.